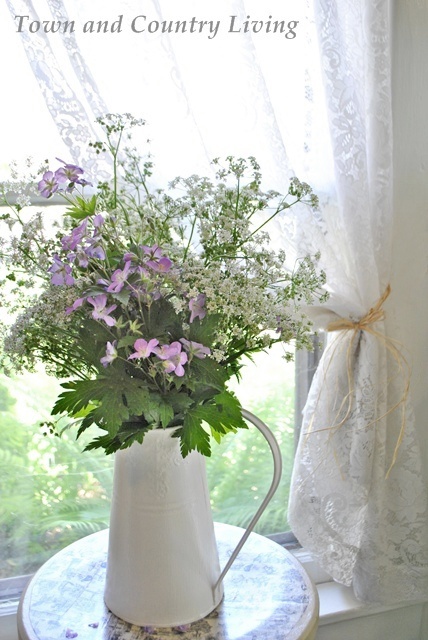 When you think of farmhouse flowers, what do you imagine? Garden daisies in a mason jar? Colorful zinnias in a white ironstone pitcher? Most likely you see a simple vessel filled with flowers from the garden. Today is Farmhouse Friday and I’m so happy our topic this month is floral accents. I don’t think there are too many days when my house doesn’t have fresh flowers inside. After you enjoy my farmhouse flowers, be sure to visit my blogging friends at the end of this post for even more floral inspiration! In just a couple months, the Virginia Bluebells will be in full bloom in our garden. Floral accents in my home are seasonal because I cut most flowers fresh from the garden. These bluebells are my favorite because they have subtle touches of pink, and when the light hits them just right, they take on a lavender shade from the mix of blue and pink. I like to tuck them in a simple enamelware pitcher and let them droop over the edges. Sometimes when I bring flowers home from the greenhouse, they end up inside for awhile before going in the garden. 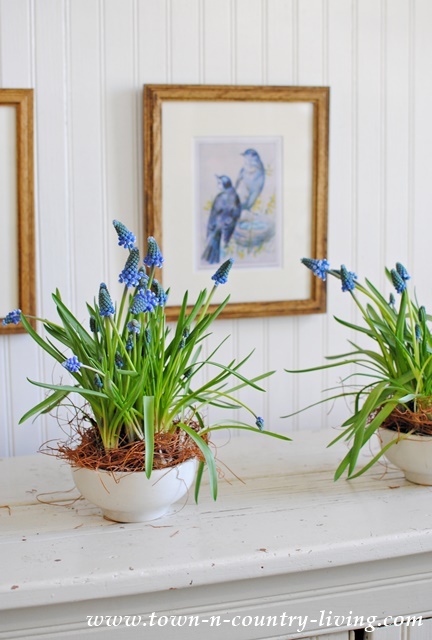 I love grape hyacinths and I do have several out in my garden, but I tucked these into white ironstone bowls and paired them with vintage bird prints for spring. I like using unusual items for vases and flower pots. Often I choose what’s already out on a shelf. 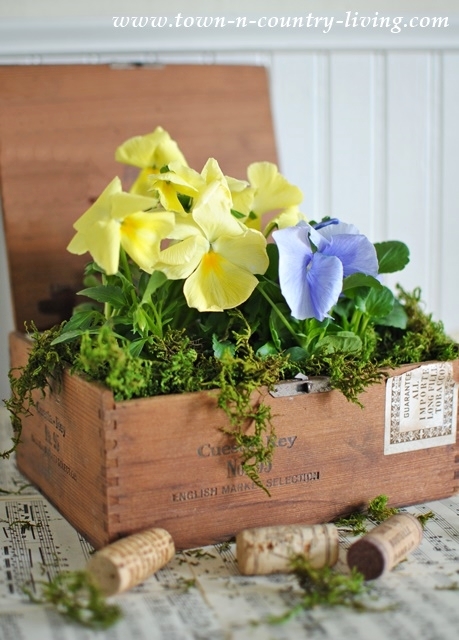 But I had the idea to plant some pansies in a rustic little cigar box. I lined the box first so that when watering the flowers, the wood wouldn’t rot. Our weather has been so weird this winter that just a few weeks ago, we still had pansies blooming outside! Our lilacs will soon be in bloom too and I can’t wait! They’re so fragrant … how can you not bring bunches of these heady flowers into your house? I should’ve planted 5 times as many lilac bushes out back! 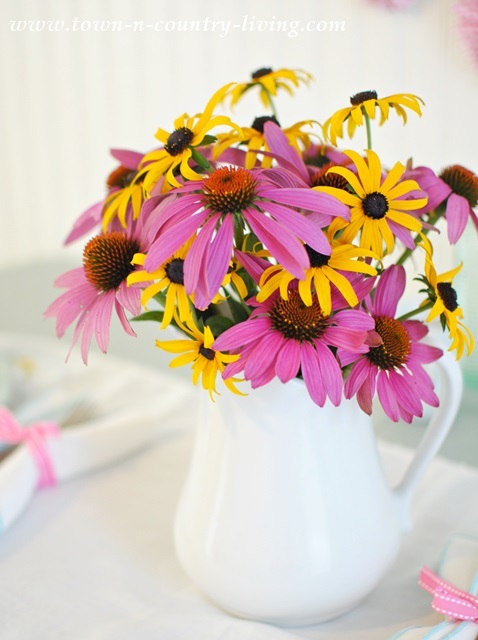 My favorite farmhouse flower arrangements are simple yet colorful. Don’t bother to try and match them or balance out the colors. 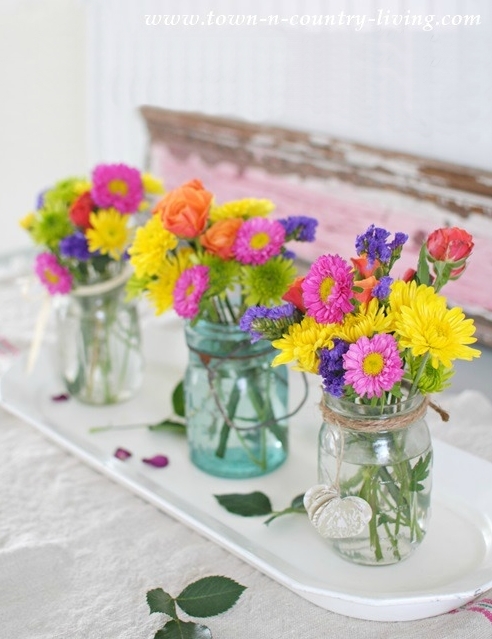 Just grab a bunch of brightly colored flowers and plop them in utilitarian vases like mason jars. If you fuss with them too much, they start to lose that haphazard appeal. 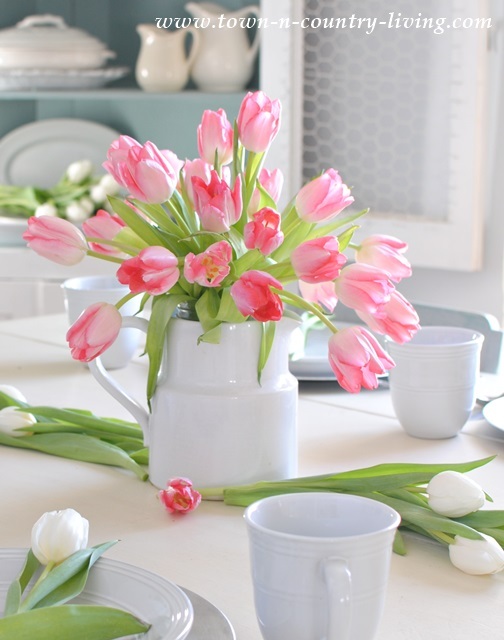 Tulips are a perfect choice for a dining room centerpiece. They’re not too tall so they don’t block the view across the table, and they cascade elegantly over the sides of a pitcher. 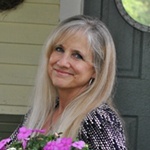 I like using just one type of flower in an farmhouse arrangement. Simple yet pretty. My favorite summertime flowers are coneflowers and rudbeckia. They’re prefect together in a white ironstone pitcher. 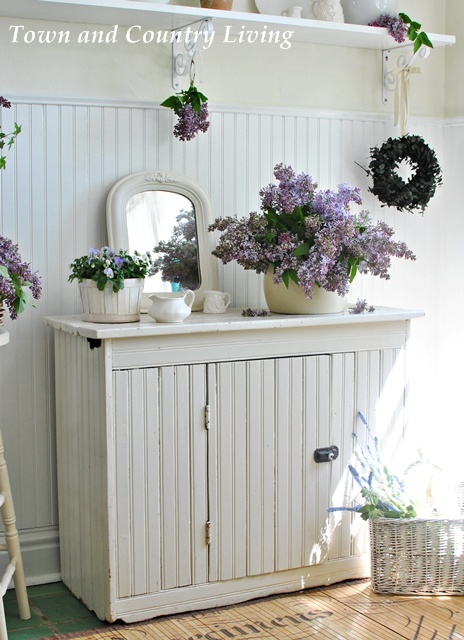 I hope you’re starting to see that you don’t have to spend a lot of money to keep fresh farmhouse flowers in your home. 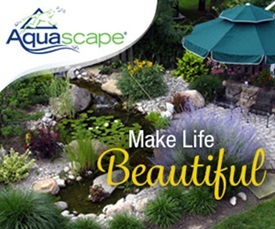 Now’s the time to plan the perennials and annual flowers you’ll add to your garden. I’m expanding my cutting garden this year so I can enjoy even more floral accents. My grandmother had a gorgeous cutting garden overflowing with mums of every type and color. Sometimes all you need for a pretty floral accent is a single big bloom in pretty pot. 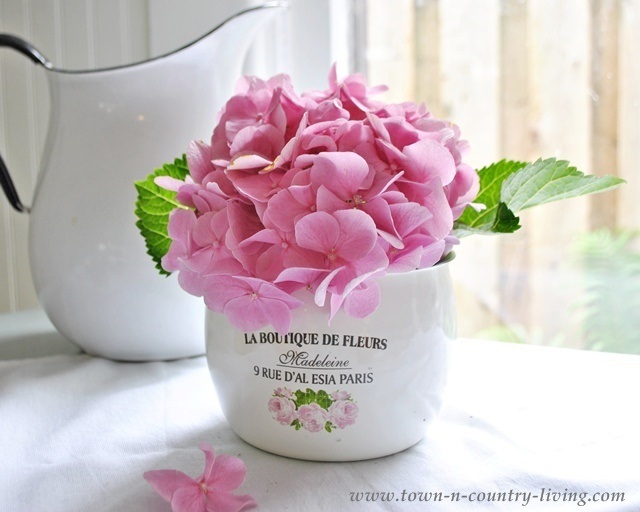 I cut this one from my hydrangea bush and tucked it in my French enamelware pot filled with water. It lasted for weeks! Not all my flower arrangements come from the garden. I actually cut these wildflowers from the side of a country road. We have prolific bloomers all over and I love the messy bouquets they create. If you want easy-to-grow flowers in your cutting garden, look no further than zinnias! They’re cheerful and hearty. You can forget to water them for a few days and they’ll be fine. Plus they come in so many colors, shapes, and heights. 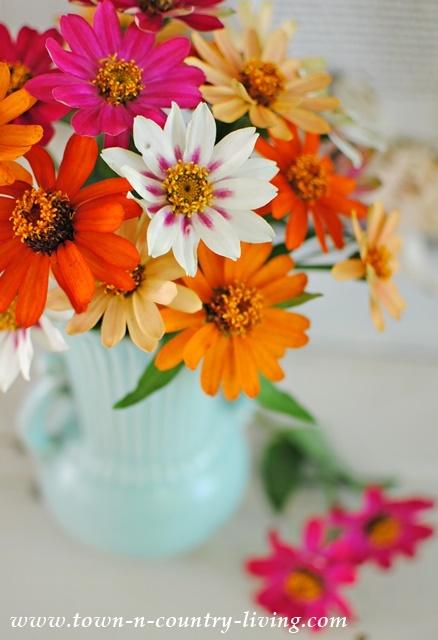 Zinnias will bloom all summer long … just make sure you give them lots of sunshine. They’ll last for a long time when you bring them inside. I guarantee you these farmhouse flowers will become a beloved favorite. 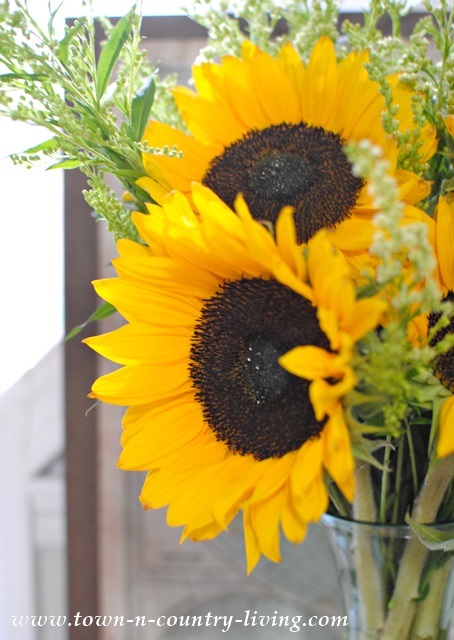 An amazing late summer/early fall favorite is the joyful sunflower. I like to tuck single stems into empty wine bottles. 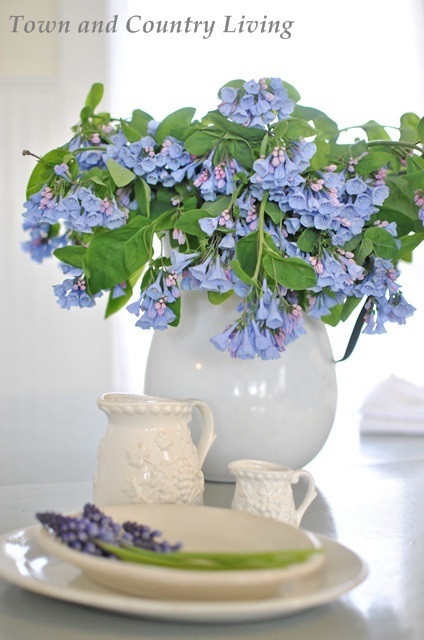 No matter which grouping of farmhouse flowers you choose, you can’t help but smile when you see them in a room. I love the variety that seasonality brings to floral arrangements, and it’s so comforting when you grow the flowers in your very own yard. 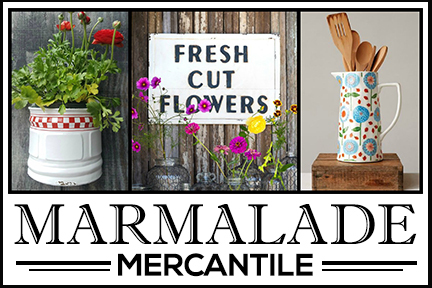 Don’t forget to visit my fellow farmhouse bloggers below to see all of their gorgeous floral inspiration! 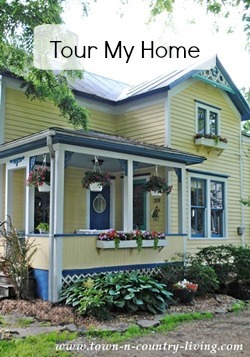 Gorgeous examples and lots of pretty inspiration, Jennifer! I really love those grape hyacinths. They are so darling! I can’t wait till it’s time to dig in the dirt in my area! Wow, so many beautiful flowers! I think you got all my favorites!! Feels like Spring! So many great ideas for arranging flowers, especially in a variety of containers. Thanks so of the wonderful inspiration!! Every single arrangement is just beautiful, Jennifer. You are so fortunate to have a garden to pick from right in your yard! They are all so lovely! This time of year it’s so nice to use flowers to brighten things up as we wait for spring to arrive!